While at least 23 of 28 union bargaining units have reached a settlement with county negotiators, social workers recently demanded lower caseloads as part of their labor contract. About 40 social workers represented by the Service Employ­ees International Union rallied outside the Board of Supervisors meeting to “bring our case out to the public,” according to one speaker. “We are overwhelmed,” Almira Garza told the board. DCFS has hired 100 additional social workers who will be carrying full caseloads by January and is in the process of screening 150 more, according to DCFS director Philip Browning. “We are concerned that cases are rising,” Browning said, citing an increase in calls to the Child Protection Hotline as one factor. New hires require a master’s degree in social work and recruiting takes time, a department spokesman Armand Monteil said. According to Goodman, the department has authority from the board for those next 150 workers, while SEIU negotiators are looking for nearly four times that number. Nurses are among the other bargaining units without a new contract. SEIU 721 also represents parks workers, librarians and employees who determine eligibility for benefits, among others. 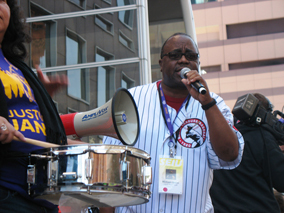 The wage in­crease is expected to be the same for all bargaining units within the SEIU. It mirrors that already agreed to by other county unions – a 2 percent wage increase this year, 2 percent next year and 2 percent in April 2015. But non-economic issues like caseloads are being negotiated separately. “We’ve made great progress — we’re not done yet,” Goodman said. Browning would not comment on the status of negotiations, referring calls to Chief Executive Officer William Fujioka, who was not immediately available for comment.